The Ancient Maya had a complex pantheon of deities whom they worshiped and offered human sacrifices. Rulers were believed to be descendants of the Mayan Gods and their blood was the ideal sacrifice, either through personal bloodletting, or the sacrifice of captives of Royal Blood. The Maya vision of the universe is divided into multiple levels, above and below the earth, positioned within the four directions of north, south, east and west. After death, the soul was believed to go to the underworld, Xibalba a place of fright where sinister gods tested and tricked their unfortunate visitors. As with all myths about Mayan Gods and the Goddess, Mayan myths discuss connections with being from other realms who came to Earth to seed the planet. Many people see the story of the Popol Vuh as the story of extraterrestrial Gods who came down and made man in his own image. When they first made man, he was so perfect, living as long as they did, he could see far and wide, clairvoyant and was as perceptive as they were. They realized that they had made a competor who was as wise as the Gods themselves, so they destroyed him and started over creating present day man. Modern man lives shorter lifetimes, is not as smart and is here to act as the servant race to the Gods. Also called Precious Twin; Feathered Serpent; Winged God. Click_Here He is the god of intelligence and self-reflection, a patron of priests. Mayan God Thoth and Quetzalcoatl were of the same Deitie. Thoth was identified to Atlantis, Egypt, Sumer, then later was identified to Mesoamerica and Peru. Venus as the morning star, called Tlahuizcalpantecuhtli; Xolotl the "Precious Twin," Venus as the afternoon star; and Ehecatl, god of wind. The cult of Quetzalcoatl reached the Maya zone where he is known as Kukulcan. Among his most important attributes are the cut shell ornament, whether used as a pectoral, earplugs or adornment in some other part of his dress. As the wind god, he sometimes wears a beak-shaped mask with which he produces the wind. Codex: Borbonicus. Mayan God Chac was the ancient god of rain and the lightning. He was one of the earliest and most worshiped gods among all the people of Mesoamerica and was a benevolent god for the Mayans, who often sought his help for their crops. Chac was often depicted with a serpentine axe in his hand as a metaphor for lighting and his body was scaled and reptilian. He was worshiped at sacred wells and was associated with the life giving rain needed for agriculture. At the dawn of time, Chac split apart a sacred stone with his axe from which sprung the first ear of maize. When he was not among the clouds, the god could be found near falling waters. Chac was associated with creation and life. Chac was also considered to be divided into four equal entities. Each division represented the North, South, East and West. Chac was also apparently associated with the wind god Kukulcan. Some debate persists as to whether or not Kukulcan was just a variation of Chac. Mayan God Kinich Ahau was the Sun God Known as the Sunface Fire Macaw. He was the Patron God of the city Itzamal. Also known as Ahau-Kin, Ah-Kin, Ah-Kinchil, Kinich-Ahaw, Kinich-Ajawpakal, Kinich-Kakmo, God-G. Among other things, he's the patron god of the number four. In this respect he commands disease and has control over drought. He was associated with the Jaguar, the most powerful denizen of the Mayan forests. He is shown as a young man, full of life and vigor like the rising sun itself. Kinich Ahau is also one of the Palenque-Triad Gods desi-gnated with Roman Numerals, in this case, III. Supposedly, he visited the city at noon every day. He would descend as a Macaw and consume prepared offerings. Mayan God Yumil Kaxob the Maize God is representative of the ripe grain which was the base of the Mayan agriculture system. In certain areas of Mesoamerica, like the Yucatan, the Maize God is combined with the god of flora Xochipili. Yumil Kaxob is principally shown with a headdress of maize and a curved streak on his cheek and is noticeable from most of the other gods through his youth. Despite this youth, Yumil Kaxob was powerless by himself. His foutunes and misfortunes were decided by the control of rain and drought. Chac, the Rain God would protect him. However, he suffered greatly when Yum Cimil the Death God exercised drought and famine. Mayan God Yum Cimil was the death god. He was also called Ah Puch and Hunhau. The god of the Underworld. His Underworld was called Xibalba. Yum Cimil ruled over Mitnal, the land of death, the lowest and most horrible of the nine Hells. His adornments were made of bone and a collar made with eyeless sockets, this was typical symbols of the underworld. Mayan depictions of Yum Cimil were either of a skeletal figure that had protruding ribs and a death's head skull or of a bloated figure that suggested an advancing state of decomposition. Because of his association with Owls, he sometimes is depicted as a skeletal figure with an Owl's head. Like his Aztec equivalent, Mictlantecuhtli, Ah Puch frequently wears bells. The Mayans believed that Yum Cimil stalked them like a hunter stalkes his prey. You can't worship Ah Puch so much as try to keep him at a great distance, so they would mourn with loud wailing in order to keep him at bay and prevent him from taking anyone else to Mitnal. Mayan God Ixtab is the Suicide Goddess of the Noose and Gallows. She is always depicted with a rope around her neck. She is also the protector of those who committed suicide. It was believed that those who committed suicide or died by hanging, together wit slain warriors, sacrificial victims, priests, and women who died in childbirth, went straight to eternal rest in paradise. Ixtab came to bring these lucky souls into the delectable shade of the cosmic tree Yaxche, where the inhabitants of paradise could rest from labor and escape from all the suffering and want. They also said and held it as absolutely certain that those who hanged themselves went to the heaven of theirs; and on this account there were many people who, on slight occasions of sorrows, troubles or sickness, hanged themselves in order to escape these things and go and rest in their eternal heaven where, they said that Ixtab, the Goddess of the Gallows came to fetch them. Mayan God Kukulcan, also known as the Serpent God, is the Mayans Supreme God, who they attributed many functions. Not only was he a god of the four elements,he was also a creator god and the god of resurrection and reincarn-ation. He orignated from Toltec Myth where he was a divine hero who taught the Toltecs laws, fishing, healing, the calendar and argiculture. He emerged from the ocean and dissappeared into it afterwards. 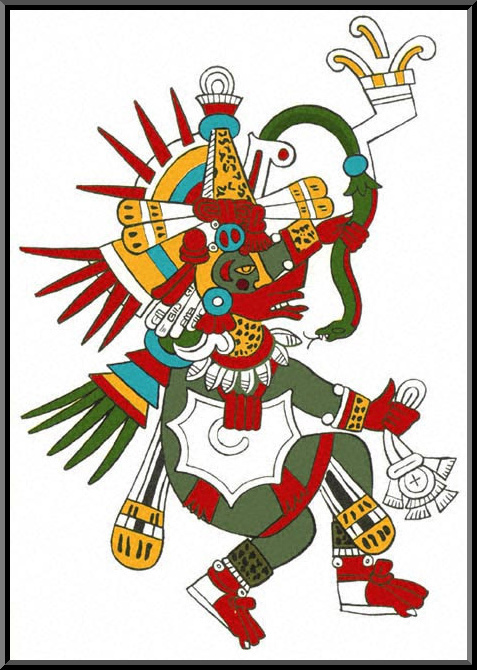 His name means "The Feathered Serpent" and the Aztec merged him with their god Quetzalcoatl. 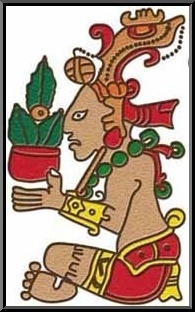 His attributes, each representing one element, are a maize-ear (Earth), a Fish (Water), Lizard (Fire), and Vulture (Air). He is the so-called "God-B." In the ancient world there are many mysteries, but none as perplexing as those found in the Mayan culture, from their beginnings to their mysterious disappearence, the Mayans have baffeled us all. One that has stumped many is actually one of the figures that is found throughout Mayan religion... the Serpent God called Kukulcan. 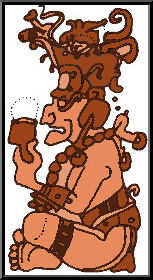 Kukulcan is one of three gods that was thought to have created the Earth. He is a serpent in his natural form and was responsible for teaching the Mayans how to run a civilization. After a brief period of being on Earth, Kukulcan returned to the ocean telling the Mayans he would return at a latter date. The Mayans perceived Europeans as the second coming of their god Kukulcan and this had eventually lead to the trust between the two cultures and the eventual defeat of the Mayans. The baffling question is, why would the Mayans think that the European settlers were gods? 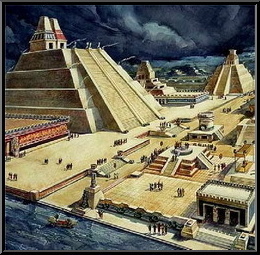 Did they look anything like what the Mayans perceived as Kukulcan? Kukulcan had a human form as well as his feathered serpent form. Kukulcan would transform into a man 6 feet tall with long white hair, but the most interesting thing was, he was a male Caucasian man with white skin! Writings from the Mayans and found sculptures of what is thought to be Kukulcan depict a very European looking figure, totally different from how the Mayans looked. Mayan's were dark-skinned Latin looking peoples. They were normally not very tall and had brown eyes. 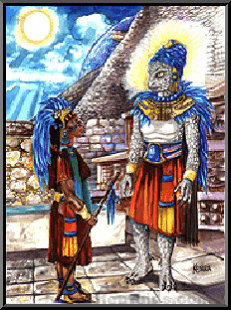 Kukulcan, in his human form, was a complete contrast, having white or silver hair, white skin, blue eyes and he was tall. Scientists and scholars alike have all wondered why this could have been the case? Why, would a civilization have a divine being... a god that looked nothing like themselves? Why would he look like people found in Western Civilization a half-a-world away? Mayan God Ix Chel the "Lady Rainbow" was the old Moon Goddess in Mayan mythology. 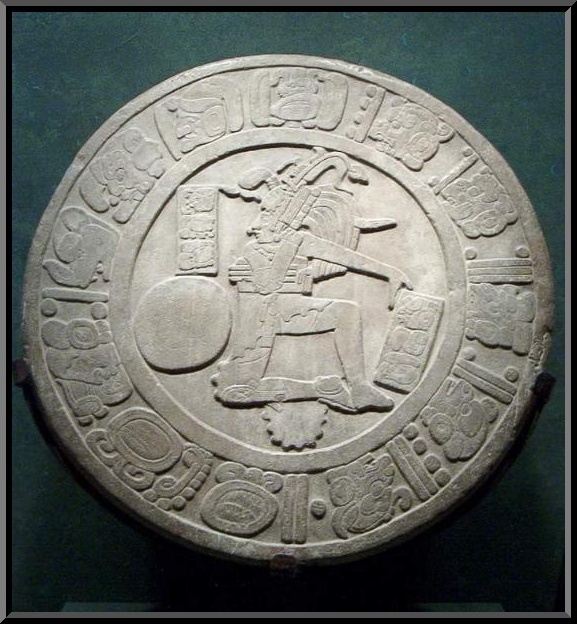 The Mayans associated human events with the phases of the Moon. Ix Chel is always depicted as wearing a skirt with crossed bones. As an ancient fertility goddess, Ix Chel was responsible for sending rain to nourish the crops. When fulfilling that function, she was calledLady Rainbow. She helped insure fertility by overturning her sacred womb jar so the waters would flow. Though sometimes depicted as a goddess of catastrophe (the woman who stands by as the world floods), many of her myths show her in a more benevolent light... as a goddess who refused to become a victim of oppression. This is a woman who, when faced with adversity, took charge of her life and turned it around. Ix Chel was almost too beautiful, this woman with opalescent skin who sat in the skies brushing her shimmering hair for hours on end. All of the gods were captivated by her. All but one that is. Kinich Ahau, the Sun God, seemed immune to Ix Chel's charms. Yet he was the onlt one she realy ever wanted. For eons, she had longed for him as she watched him glide across the sky in all his golden splender. But the more Ix Chel followed him, the worse the weather on Earth became. As she chased after him the tides would rise, creating floods that inundated the fields and caused the crops to die. So enamored was she, that Ix Chel did not notice the havoc she was causing on Earth. Like many moon goddess, Ix Chel was a fine weaver, and it was the beautiful cloth she wove that finally captured Kinich Ahau's attention. Soon, they had become lovers. Ix Chel bore the Sun God four sons. They were the Jaguar Gods and could creep through the night unseen. They were named for the four directions and each one was responsible for holding up his corner of the sky. Unfortunately, Ix Chel's love affair with the Sun God drew the ire of her disapproving grandfather. In his anger he struck Ix Chel with lightning killing her. For the next 183 days, she lay lifeless as hundreds of dragonflies surrounded her body and sang to her. Waking suddenly, she returned to the palace of the Sun God. Their relationship was turblent... Kinich Ahau had a suspicious nature and was often consumed with jealousy. To make matters worse, he also had a fiery temper. Suspecting that the innocent Ix Chel was having an affair with his brother, The Morning Star, Kinich Ahau threw her out of the sky. Mayan God Itzamna is said to be the founder of the Mayan culture. He brought his people maize and caco, taught them script, healing and the use of the calendar. As the bringer of culture he became the state-god of the Mayan Empire. 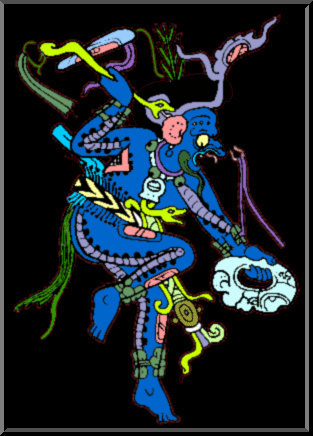 Itzamna is also called "God D" and bears the title of Lord of Knowledge. 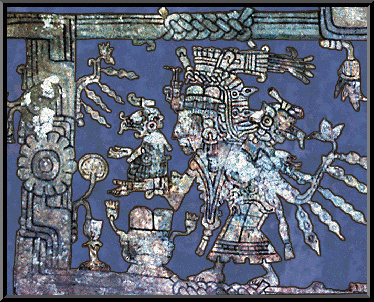 Itzamna, son of Hunab Ku, stands out in Mayan mythology. In the codices, he appears as an old man with a large jaw, sunken cheeks, an aquiline nose and a beard. He has two hieroglyphs, the first of which is a conventional representation of his own head, and the second of which contains, as its prin-cipal element, the symbol for the day Ahau, the last of the twenty Mayan days. Most of the figures which appear in sculptures, frescoes and vase paintings are of men, rulers, priests, acolytes, warriors and prisoners. The paintings of gods have been taken from the three extant Mayan hieroglyphic manuscripts. In view of the strict cultural continuity of these codices, it is possible that the Mayan gods have remained the same during the different historical phases of the Mayan civilization. It is said that Itzamna was the Lord of the Heavens, of the Night and of the Day. In these last two functions. he is closely associated with Kinich Ahau, the Sun God, "Lord of the Sun's Eye," who was worshipped especially in Izamal, in the north of Yucatan, together with Ix Chel, the Moon Goddess. It is possible that in fact Kinich Ahau is simply a particular manifestation of Itzamna in his character of Lord of the Day, that is, the Sun. 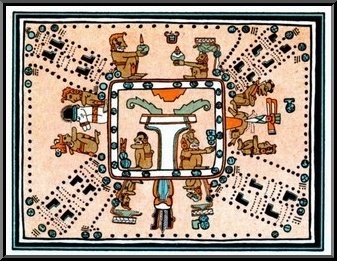 It is said that Itzamna was the first priest, the inventor of writing and books (the codex), that he gave to the different parts of Yucatan the names by which they are known, and the he divided up the lands of this region. The nature of these activities suggests that the cult of Itzamna did not orignate in Yucatan, but rather in some other Mata area. The Maya kept time with a combination of several cycles that meshed together to mark the movement of the Sun, Moon and Venus. 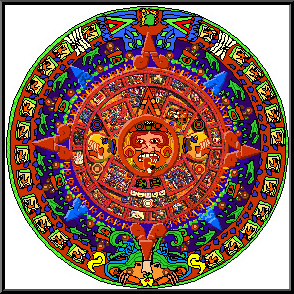 The Mayan calendar of rituals known as the Tzolkin was composed of 260 days. 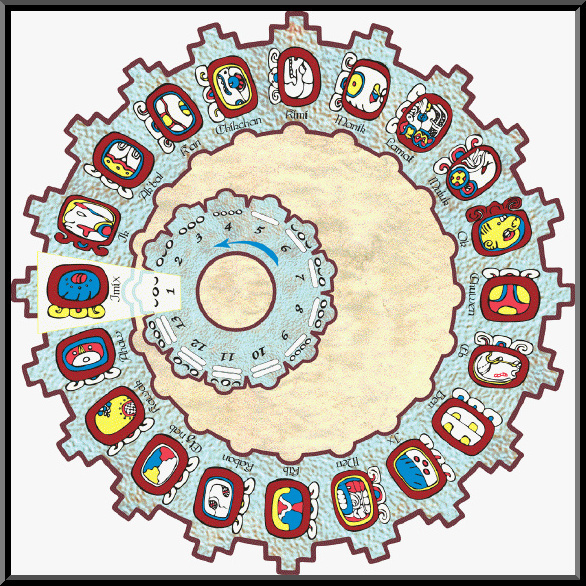 This Mayan calendar pairs the numbers from 1 through 13 with a sequence of the 20 day-names. It works something like our days of the week pairing with the numbers of the month. The symbols represent the 20 day-names and are identified with their Yucatec names, pronunciation and approximate translation. The name, meaning and symbol can vary in different Maya languages. Also, each day can be represented with more elaborate glyphs known as "Head Variants"-a formal writing system which can be loosely compared to our script alphabet versus our print alphabet. 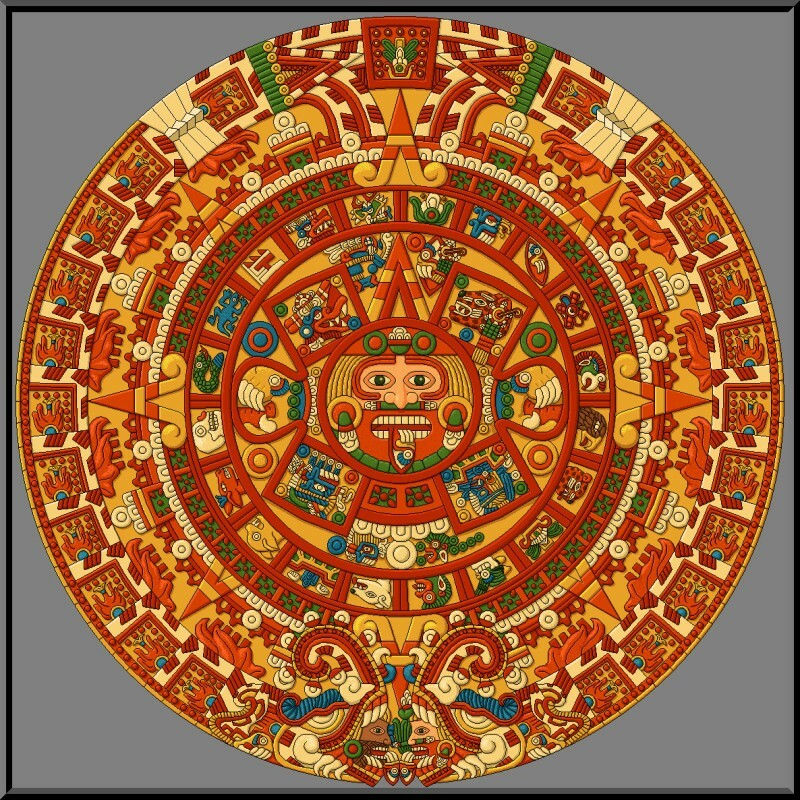 The classic Mayan civilization was unique and left us a way to incorporate higher dimensional knowledge of time and creation by leaving us the Tzolkin calendar. The present calendar ends on the Winter Solstace in the year 2012. "6 1k 10 Camber" would be the same as if we wrote 20 June 30 gemini. As both of these wheels turned, so passed the Mayan Calendar Years. Every 52 years... the cycle began again. It was on one of these auspicious years that Cortez landed, thus giving credence to his God-like Image. Archeologists claim that the Maya began counting time as of August 31, 3114 BC. This is called the zero year and is likened to Janurary 1, AD. All dates in the Long Count began there, so the date of the beginning of this time cycle is written 13-0-0-0-0. That means 13 cycles of 400 years will have passed before the next cycle begins, which is on December 27, 2012. The New cycle will begin as 1-0-0-0-0. On the day of the Winter Solstice, December 21st. 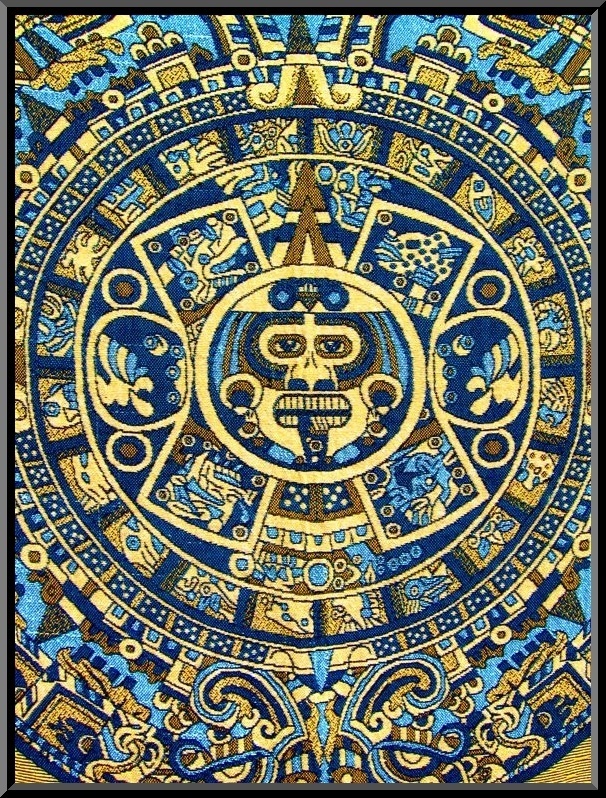 2012, most of the greater and lesser Mayan cycles converge. This has often been seen as the Doomsday Scenario awaiting the fate of all mankind and our planet. It has also been a point of heated debate in beliveing in the validity of the ancient calendar as meaningless in today's modern society. The Astrophysical reality behind this particular date is that this is the precise day that the solar meridian crosses the galactic equator. The Earth, Sun, and the galactic center of the Milky Way are in perfect alignment, with the Sun directly between the Earth and the center of the Galaxy. The ecliptic plane of the Milky Way Galaxy is within a dark band stretching across the length of it which the ancient Mayans called the Road to Xibalba. In reality, this dark band is caused by interstellar dust particles obscuring the view of the stars that populate this region of space. The midpoint of this dark, narrow band in the Milky Way is the Galactic Center, in the direction of the constel-lation of Saggitarius, with about 50,000 light-years in either direction to the outter reaches of this midsized galaxy. This particular juncture in time is also believed to be alluded to in The Great Cross at Hendaye a my-sterious cross of unknown origin in Europe. 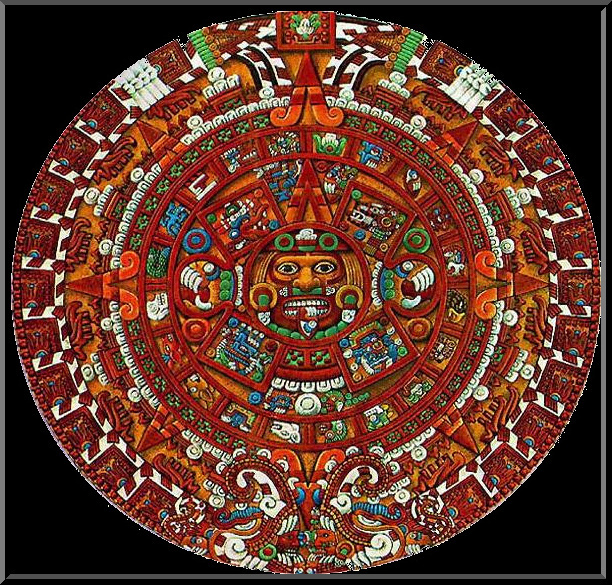 Many of us are aware of the Mayan calendar but, not many people truly understand what it means and how it works. Yes, their calander ends on December 21, 2012, but what does that mean? What is their calandar based of? How does it come to that? The Mayans had a very precise understanding of our solar system's cycles and believed that these cycles coincided with our spiritual and collective consciousness. The most significant of which has much to do with the 2012 prophecies. The Mayans prophesied that from 1999 we have 13 years to realize the changes in our conscious attitude to stray from the path of self-destruction and instead move onto a path that opens our consciousness to intergrate us with all thet exists. The Mayans knew that our Sun, every so often synchronized with the huge central galaxy. And from this central galaxy a "spark" of light which causes the Sun to shine more intensily, producing giant solar flares as well as in the Sun's magnetic field. The Mayans say this happens every 5,125 years, but also that this causes displacement in the Earth's rotation, and with this movement, great catastrophes will be produced. The Mayans believe in the universal processes, like The Breathing of the Galaxy, these cycles never change. What changes are then, is the consciousness of man as he passes through it... always in a process towards more perfection. Based on their observations, the Mayans predicted that from the initial date of the start of their civilization, 4 Ahau, 8 Cumku, which is 3113 BC, after one cycle being completed 5,125 years in their future. December 21st. 2012. The Sun, having received a powerful ray of synchronizing light from the center of the galaxy, would change in polarity which would produce a great cosmic event that would propel human kind to be ready to cross into a new era, the Golden Age. It is after this that the Mayans say we will be ready to pass through the door that was left by them, transforming our civilization based on fear to a vibration much higher in harmony. In the last cataclysm of the Mayas, the civilization was destroyed by a great flood that left little survivors of which there were descendants. They believed that having known the end of their cycle, all mankind would prepare for what is to come in the future and it is because of this that they would have preserved the dominant species, the human race. They say that the coming changes will permit us to make a quantum leap forward in the evolution of our conciousness to create a new civilization that would manifest great harmony to all mankind. Their first prophecy talks about "The Time of No Time." A period 20 years they call a Katun. The last 20 years of the Sun's cycle of 5,125 tears. This cycle is from 1992 to 2012. They predicted that during these times, solar winds would become more intense and could be seen on the Sun. This would be a time of great change for mankind. It would be our own lack of preservation and contamination of the planet that would contribute to these changes. According to the Mayans, these changes would happen so that mankind comprehends how the universe works so we could advance to superior levels, leaving behind super-fical materialism and libertating ourselves from suffering. The Mayans say that after the start of Katun, which is to say 1999, we would enter a time of darkness which would force us to confront our own conduct. They say that this is the time when mankind will enter The Sacred Hall of Mirrors where we will look at ourselves and analyze our behaviors with ourselves, with others, with nature and with the planet in which we live. A time in which all of humanity, by individual conscious decisions, decides to change and eliminate fear and lack of respect from all of our relationships. The Mayans prophesied that the start of this period would be marked by a solar eclipse on August 11, 1999, known to them as Ahu, 8 Cauac. And would coincide with a planetary alignment, the "Grand Cross Alignment" This would be the last 13 years of the Katon period. The last opportunity for our civilization to realize the changes that are coming at the moment of our spiritual regeneration. The first prophecies were attained by their study of our Sun. The Mayans discovered that the entire solar system moved. That even our own universe had its own cycles. Repetitive periods which begin and end like our day and night. These discoveries led to the understanding that our solar system rotates on an elipse that brings our solar system closer and futher from the center of the galaxy. the central light of the galaxy. It takes 25,625 years for our solar system to make one cycle on this elipse. One complete cycle is called a galactic day. The cycle is divided into two halves similar to our day and night. The half furthest away is the 'night'. Each day and each night lasts 12,800 years. Which is to say, the central galaxy is the Sun for our entire solar system. The Mayans discovered that every grand cycle has its minor cycles that carry the same characteristics. One galatic day of 25,625 years is divided into five cycles of 5,125 years. *The first cycle is the galactic morning, when our solar system is just coming out of the darkness to enter the light. *The second cycle is the mid-day, when our solar system is closest to the central light. *The third cycle is the afternoon, when our solar system begins to come out of the light. *The fourth cycle is the late-night before dawn, when our solar system has entered its furthest cycle from the central light. *The fifth and last cycle is the night before dawn, when our solar system is in its last cycle of darkness before starting again. This is the cycle we are currently coming out of.